Grab a pan or cooking bowl, heat the oil and butter together. Insert the onion with a pinch of salt. Cook until the onion is fully tender, this can take about 10-15 minutes. Then pour the grated garlic and cook it for another 5 minutes. Give it a good stir. Pour the grated tomatoes into the pan and put them in juice. Cook on medium heat while letting the tomatoes break by using a ladle or spoon-rear. The tomatoes will soften and begin to ripen within 10 minutes or so. Heat low, chicken broth or pour into water. Boil it and cook for 15 minutes. Remove the pan from the heat after this time period and cool down. With the help of a hand blender, slowly make almost the cooked tomato puree. You can strain the soup at this stage, if you wish or leave it chunky. 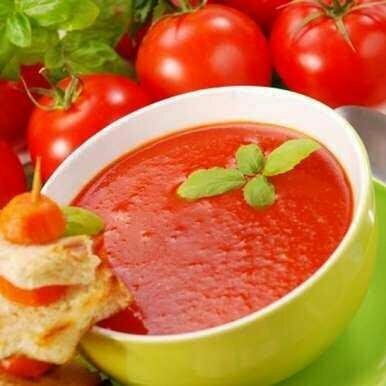 Switch on the stove, put the tomato soup back to pan and reduce heat. Pour in the cream and give it good stir. Add in black pepper, and salt to taste. You can adjust the Poha according to your requirement. Serve the hot heat by garnishing the basil leaves. Nice. I'll try it for sure. Thanks for sharing.